"In 1996, the Chronicle’s Sam Whiting described it as “an interesting place to watch a police stakeout”; in 2007, Colby Buzzell wrote in the Chronicle that he’d “be amazed if anybody who frequents Club 21 even owns a computer.” Things haven’t changed much over the decades. 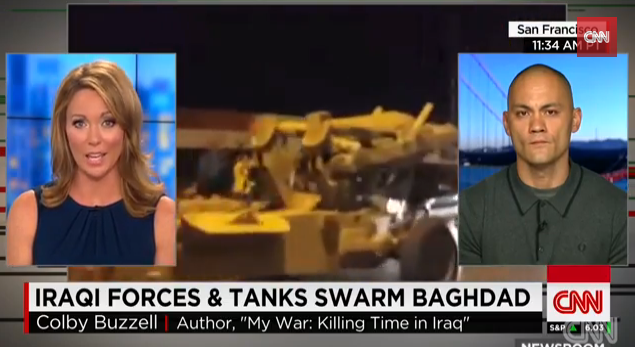 But..."
"This one time, in Iraq..." Veteran @ColbyBuzzell on Brian Williams. A selection reading of books, fiction and non-fiction related to the wars in Iraq and Afghanistan. "MY WAR: KILLING TIME IN IRAQ, by Colby Buzzell. This irreverent, episodic memoir grew out a blog that the author, an Army infantryman in Iraq in 2003-4, wrote from the front lines." Fresno County Public Library (FCPL) is pleased to have been chosen to participate in a California Reads initiative, a statewide program that brings Californians together to explore important topics through reading and discussion. This year the theme is War Comes Home: Our Veterans, Our Communities and will feature a talk by Colby Buzzell, author of My War: Killing Time Iraq. Readings from Colby Buzzell (Lost in America), Nick Mamatas (Love is the Law), Susie Hara (Finder of Lost Objects), Lauren Becker (If I Would Leave Myself Behind), and Christy Chan (Pen Pals) explore what frenemies are for. With MC James Warner (All Her Father's Guns). "How I learned to stop worrying and love bombing the hell out of Isis"
Do Iraq War veterans think ISIL is undoing what they fought for? Two Iraq War veterans, former U.S. Army Specialist Colby Buzzell and former Marine Staff Sergeant Joe Dimond, join Consider This host Antonio Mora to discuss the current situation in Iraq. "I remember Mosul, but Iraq 3.0 is what happens when you exit a war early"
Five conversations in a veteran's mind, before and after the return of Isis – none with a plan, none with a point. Just death. What else can you say? Radio Times, a live interview show out of WHYY in Philly and NPR Sirius: Marty Moss-Coane talks with three guests: COLBY BUZZELL, a former infantryman in the U.S. Army and the author of Lost in America: A Dead-End Journey, AARON GLANTZ, a staff reporter for the Center for Investigative Reporting, and MARK THOMPSON, a Pulitzer Prize reporter who covers national security and the military for Time magazine. On Friday, Department of Veterans Affairs Secretary Eric Shinseki resigned amidst the growing scandal over access, secret waiting lists, and bad management at V.A. hospitals around the country. But will this change the problems that many veterans say are endemic across the V.A. healthcare system? Today, we look at what’s wrong with the V.A. healthcare system and if it can be fixed. Upon his return, Buzzell reacquainted himself with his native country by undertaking a cross country journey beginning at his home in San Francisco and ending in Detroit. Equipped with whiskey, nicotine and a ’65 Mercury Comet, Buzzell prodded the under belly of our ailing nation. Scanning a panorama of forgotten towns filled with lost souls, juke joints and flop houses, he examined the mood and character of his fellow countrymen and wrote of his observations in his new book, Lost in America: A Dead End Journey. I spoke to Buzzell on the phone recently and discussed the places he went, the people he met and the ghost of Jack Kerouac.